The holiday season is upon us so we’re all thinking about fancier clothes, right? 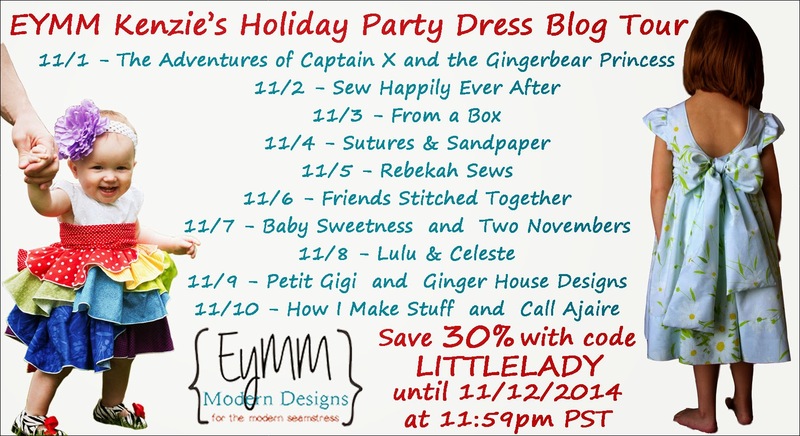 I’ve been working hard behind the scenes on a few fun holiday things and the first up is the Holiday Tour for EYMM‘s Kenzie’s Party Dress. I chose to make the high waisted skirt instead of the dress because skirts are starting to get a lot more rotation around here. I adore the high waist look and the flounces in this skirt pump up the dramatic flair. And if we know anything, it’s that Bean LOVES the drama, hehe. I paired the skirt with a plain long sleeve tee to add a bit of casual style. I really like how the high waist and oversized sash become more of a feature when the top doesn’t take away from the skirt. Speaking of the sash, it ties in giant bow in back hiding the elasticized back waistband. The sash and waistband are made with a lovely white sateen. 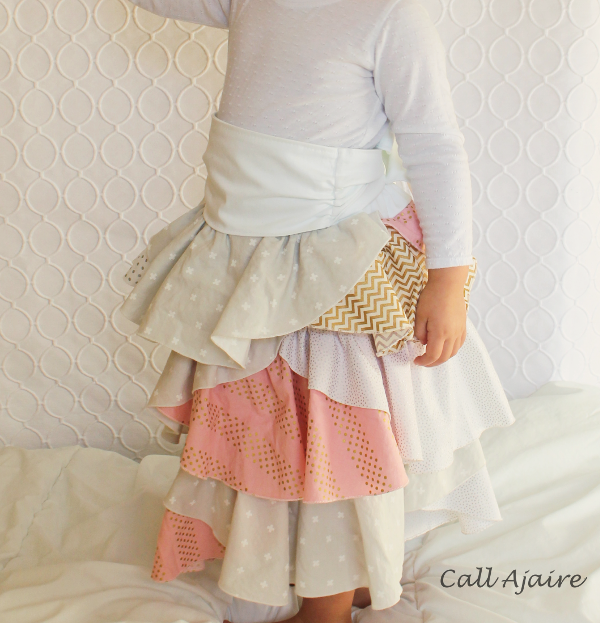 Though holiday colors would be fun, I decided to use some whites, off-whites, and pink fabrics so this skirt could be worn year-round. The metallics with the neutrals (yes pink is a neutral around here) feel wintery-holiday to me so I think it’ll be perfect for a Thanksgiving skirt for Bean, but really this would be lovely next spring as well. 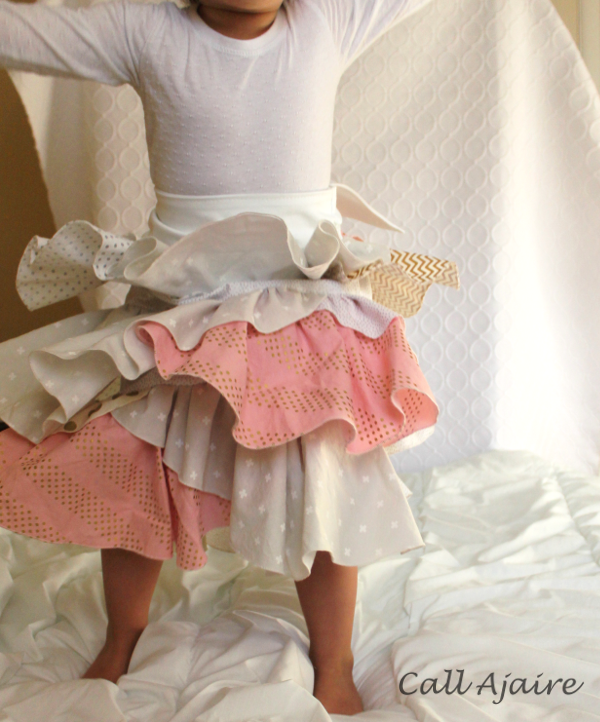 Bean LOVES this skirt and the flounces are so fun when she’s jumping and twirling. Which was pretty much the entire time she was wearing the skirt! The pattern does a great job of walking you through those layers of flounces. What looks like it took ages to make really comes together pretty quickly. The part that took the most time was finishing the edges of the flounces and I used the roll hem option on my serger so even that went quickly. Kenzie’s Party Dress (*affiliate links) is a pdf pattern that has a few purchase options. You can purchase the newborn to 4T pattern, the 5 to 18Tween pattern, the 18″ doll pattern, or you can purchase the bundle with all the sizes for a discount. 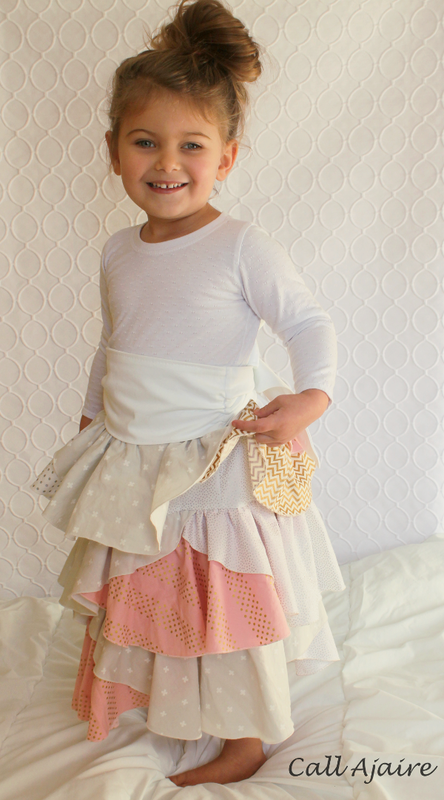 I made Bean’s skirt in size 4T, but I purchased the bundle so we can use this pattern for years. Whichever you choose, you can use the code LITTLELADY through November 12th to receive 30% off your purchase! You should take a moment to look at the rest of the dresses and skirts on the tour. There’s also a giveaway worth $125 in prizes so follow the Rafflecopter instructions below to enter. The colors are fantastic and I love the way it moves! It would also make a great costume for jane of the jungle if you did lots of amazon type fabrics! In person it's really sweet. She looks like a little fairy bouncing around! It's quite difficult to mix more than 2 fabrics together, you've succeeded with 5. Amazing! I love the colors too! 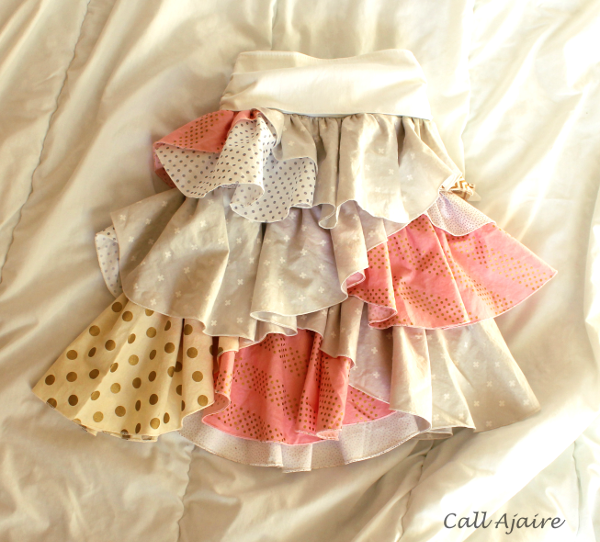 What an adorable skirt. Love that it can be dressed up or down. I love this skirt! I think it's my favorite variation on the pattern. The hight waist and flounces are just so adorable. 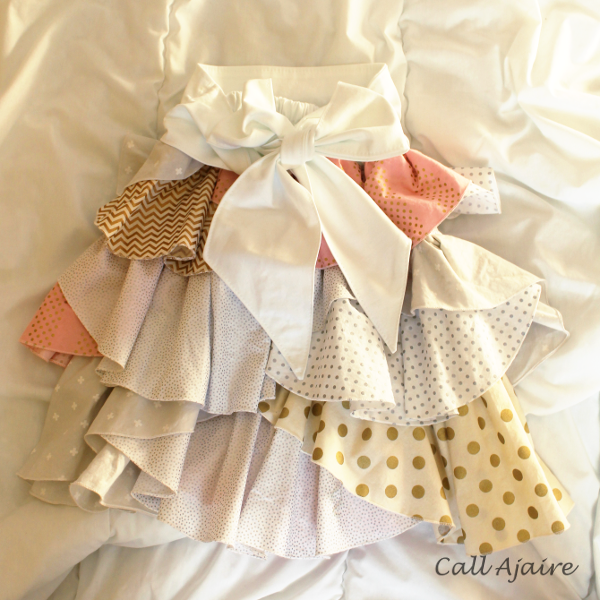 Your fabric selection is gorgeous and I love the idea of pairing it with a more casual top. And hey! High waisted skirt means it can be worn with those T-shirts that are getting a bit small and showing some belly, right? Raphaelle, it's like you read my mind with the too small shirts haha. Thanks so much for the sweet comment! That is the best comment Olu! I wanted it to look effortless, but it took a lot of editing to stick to these fabrics. I had an orchid cotton + steel that I really wanted to use, but in the end it would have taken away from the natural feel of the others. I really appreciate that you took the time to tell me what you think! That's perfect Amy! It's exactly what I was going for so it feels really good to hear 🙂 Thanks you!! Love, love, love this skirt! M would be in heaven. I am not sure I have the energy to sew this up. You did a great job! This is so fun and pretty. I love all the fabrics you used. Haha ALWAYS! Thanks for coming by Emily. Ow, it's cute!! Love the dreamy colour scheme!